We may be looking at the wrong hills. The Chino hills are 55 miles out and he is talking about are 20 miles out. The ones that are 20 miles out seem to be the Baldwin Hills. 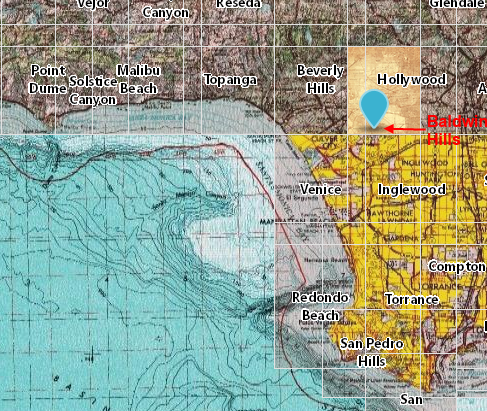 But if this is like the other USGS map of the Chino Hills from the same system (I have a Topographic map on the previous page), the Baldwin Hills heights are 400+ meters. JTolan may be mistaken that it is 400+ feet. 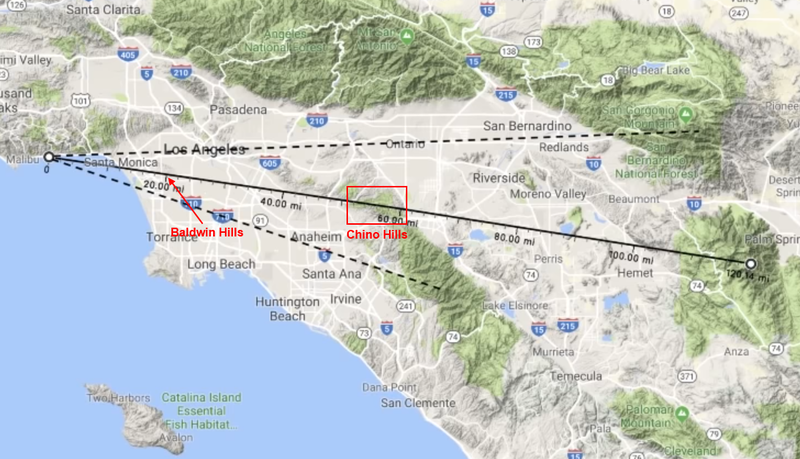 The peaks seem able to range from 400 to 500+ meters if the units are the same as the Chino Hills map from the same system. 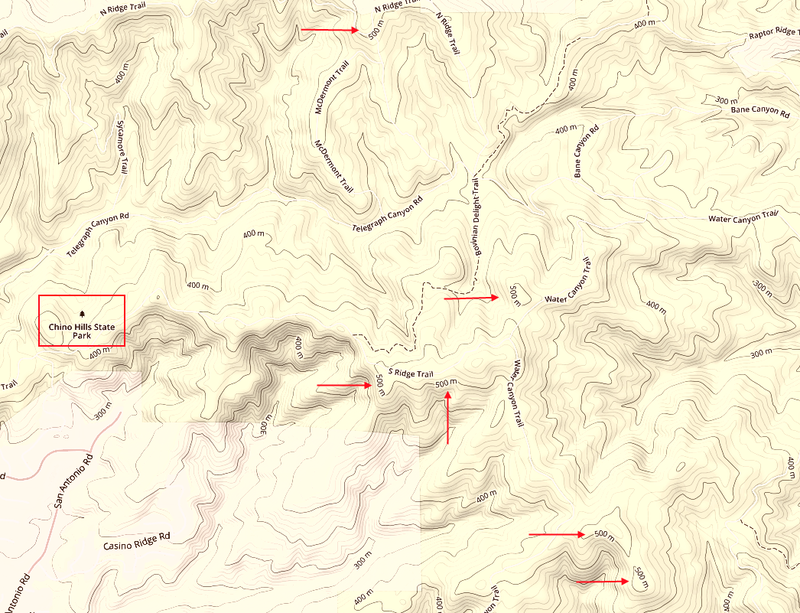 If the units are meters, rather than feet, like the Chino Hills map from the same system, it seems to suggest that none of the mountain should be visible. We may be looking at the wrong hills. The Chino hills are 55 miles out and he is talking about ones that are 20 miles out. I'll read the rest of what your wrote after that, but I'd like to first comment that I skipped over your identification of that obscuring ridge at being the elevation 1600+ foot elevation rise 55-60 miles away from Malibu Bluffs because I didn't want to bog down on that since it didn't matter. Claiming that was Chino Hills benefited your flat earth argument, but I let it go because it still didn't work out in FE favor. I wasn't making that mistake. I know those are the lower hills at 18-20 miles we're seeing, which constitute the area around S. La Brea Ave and the Inglewood oil fields. If you read my previous posts, you can see that. 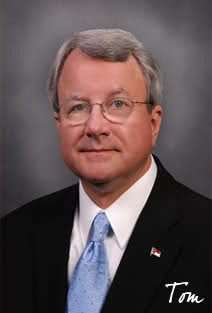 Plus, JTolen also identified that land rise as 400' elevation 20 miles down range. I worked a higher elevation figure (450') than did JTolen, and that's how I arrived at a no-refraction 1455' (13%) visible. That difference (me using 450' hills at 20 miles; you using 1657' hills at 55 miles) probably accounts for the difference between my 13% visible and your 11% visible conclusions, though you also used 120 miles to San Jacinto whereas I used the correct 117 miles. 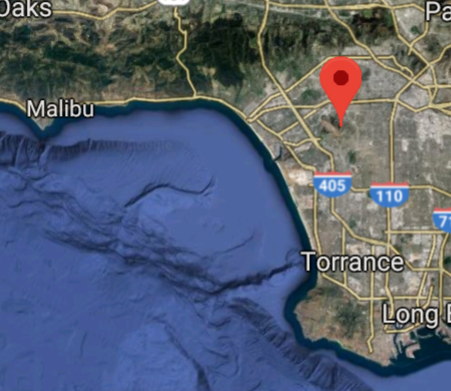 On a flat earth, the Chino Hills rise should be visible higher than the Ladera Heights rise. On a globe earth, they should not. I don't see them in the image, so as I said earlier, that's another point in favor of a convex earth. Now, I'll read the rest of your post. I may be mistaken. After checking with other sources on the height of those hills, the USGS map appears to be in feet. It changes units between feet and meters depending on what map you are looking at, without indication that the units have changed. JTolan is correct that they are 400+ feet in height. You're looking at the wrong spot, Tom. Looks like you do have the right spot (though Baldwin Hills are more to the north). 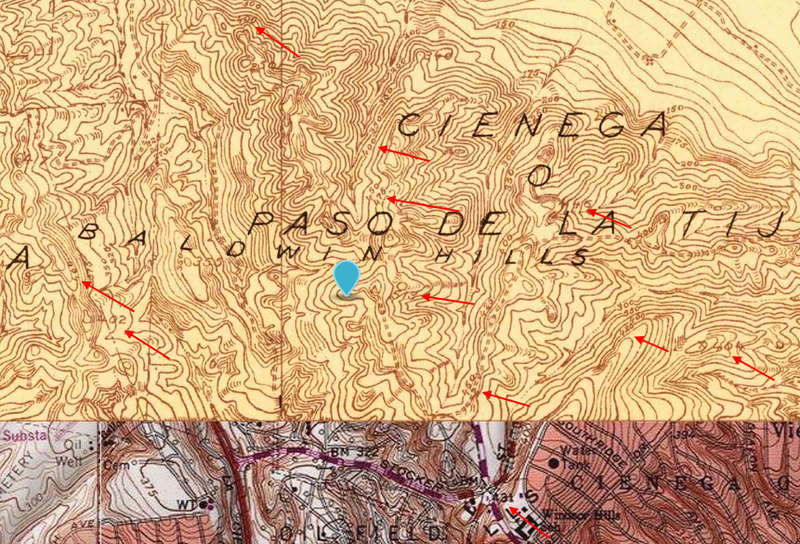 Based on your thinking that the elevation was 400 m vice 400 ft, I thought maybe you were looking at the Hollywood Hills on the topo chart. Here. This is where the sight line crosses the highest elevation point of those hills. I will take a look at your location argument in a minute. 0.312 - 0.217 = 0.095 degrees visible. If the units are in feet, it still appears that the entirety of the mountain should essentially be invisible. Yes, the two locations seem to be the same. We're on the same sheet of music now. Yeah, I never noticed that that was also Baldwin Hills on the east side of that Kenneth Hahn State Recreation Area. That ridge line is the western edge of the eastern section of that bedroom community. Baldwin Hills is at the northern edge of those hill. South La Brea Ave runs right along that ridge line. So, as long as we're agreeing that it's 400' (I'm actually calling it 450' along the point where the Malibu-San Jacinto sight line crosses it) at a distance of 20 miles, we're working from the same data. The only thing you might still want to correct is the distance to San Jacinto. JTolen has it at 120 miles on his graphic, but he cites the correct distance of 117 miles (617,760 feet) in the video. And that's what the distance maps out to be also. So if you are trying to see a 10,000 foot mountain from 150 miles away, you should still be able to see 9,900 feet of the mountain. Correct? Edit: been a long day, and I just realized it is 8" per mile squared, so when Im not driving I'll recalculate ... Sorry if this is what you have already done. Ok, so just using an online calculator it looks like the drop at 150 miles should be around 15,000 feet, so now this is a huge problem for RE.... That is very peculiar to say the least! Ok so the viewing distance is 120 miles, not 150. That makes a huge difference. At that distance about 1/3 of the mountain should still be visible. Which is what it looks like in that video. You got 12% of the mountain visible 117 miles away from an elevated vantage point of 150' and given a terrestrial obstacle of 450' 20 miles away. That's close enough for me that I don't think I need to quibble over the small delta. Work out the geometry for a flat earth topography now. The problem isn't a straightforward earth curve calculation. There's a 450' obstruction 20 miles down range that increases the amount hidden. It, too, is affected by the curvature so not all 450' serves as obstruction. Ok, I assume that is what the current debate with all the numbers and figs is all about... That was a good summarization of it, thanks! I'll think about this added variable for a bit and see if I have anything else to add. Thanks again to you both for putting up with my late and slightly discombobulated entry into this discussion! 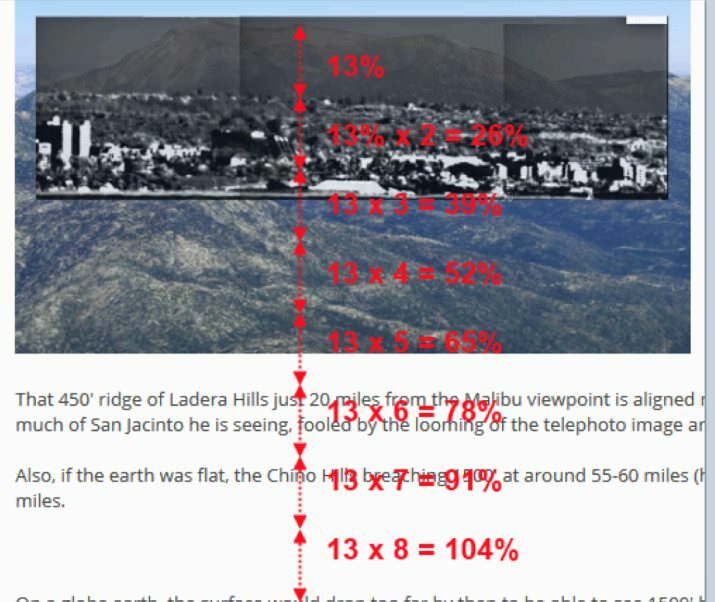 Does the viewable mountain below looks like it takes up 7.8 - 13% of the total mountain? Before we go onto that aspect of the analysis, are we in agreement that JTolen Media1 was wrong to claim that San Jacinto should not be visible from Malibu Bluffs? Will you work out what the flat earth predicts the visible/not visible height values should be? With those in hand, along with our RE calculated numbers, I'm more than eager to dive into what we're seeing in these images. Tom, you are talking about perception. I love mountains and pay very close attention to them, and when you are far away from a mountain it always looks like you are viewing the entire mountain. The hint that you are not is that regardless how large the mountain looks from afar, you don't see any trees in the mountain. That means you are looking at the timberline which is the last few thousand feet of a mountain (depending on the mountain). The base of the mountain will be WAY below where it should be, if we are only seeing ~7.8% to 13% of that mountain. The Round Earth Theory predicts that the based of the mountain would be at around the area of the red line, or at around the yellow line which is off screen, depending on whether we are using 117 miles or 120 miles for the distance calculations from the last page. 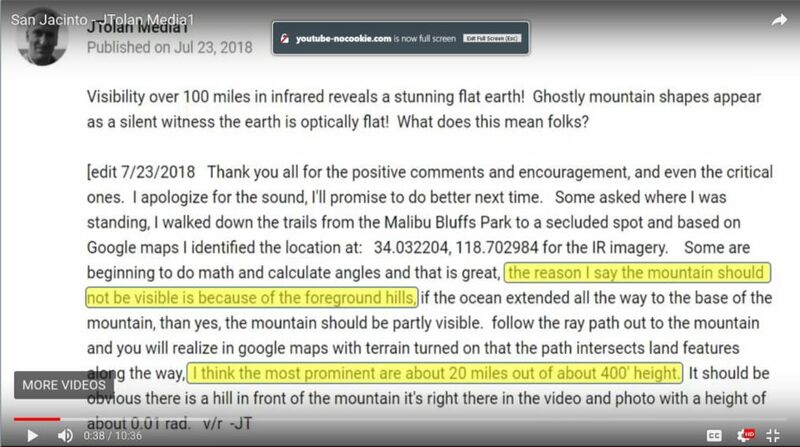 13% and 7.8% is in reference to the amount of mountain the person in the OP should have been seeing of the mountain, according to 117 miles or 120 miles, according to the Round Earth Theory.